Farang – original Thai food from Sebby Holmes and the team, showcasing the very best fresh Thai and British produce. Farang began in 2016 trading at street food markets throughout London. A year later we took up residency in our current home in Highbury & Islington as a pop-up. After excellent reviews, we took on the space permanently and since then it has gone from strength to strength. The team is very excited that we were recently inducted into the National Restaurant Awards top 100 and awarded a MICHELIN Bib Gourmand. We also received the Thai select award from the UK Thai Embassy which certifies authenticity and the freshness of our ingredients. We’re a young team of enthusiastic individuals, who over the last few years have bought our passion and skills to the table. Farang has never taken any funding or investment and all profits go back into the restaurant and our staff. We hope you like where we’re at. A takeaway menu, with a selection of our favourite dishes is also available from 5.30pm each day for collection until 10.00pm – simply phone through your order and we'll have it ready for you to collect and enjoy at home. We are dog friendly during Saturday lunch and for evening tables for those with early dinner reservations (joining us by 6pm) through the rest of the week. We do love dogs, but the restaurant gets busy later so to be fair to them and others we can only accommodate them earlier in the night. In the good weather, we can book you and your pup a table outside at any time. Fortunately loads of people seem to love our food, so reservations are strongly recommended. Or failing that, you can always make a reservation online through OpenTable. a coconut, brown crab & minced tiger prawn relish with turmeric, lime, ginger, pickles, crispy shallots and fresh roti bread to dip. Chiang Mai curried egg noodles, smoked squash, pickled mustard greens, fresh lime & chilli jam. The Farang team can also be found bringing what we do best to private hire events at the restaurant and beyond the bricks and mortar of our Highbury restaurant. We cater for corporate events, private parties, weddings, and big birthdays. To see our sample event menus click on the button below. Sebby began his cheffing career at the age of thirteen, training in British cuisine before falling for Thai food during a tour of Asia in 2008. 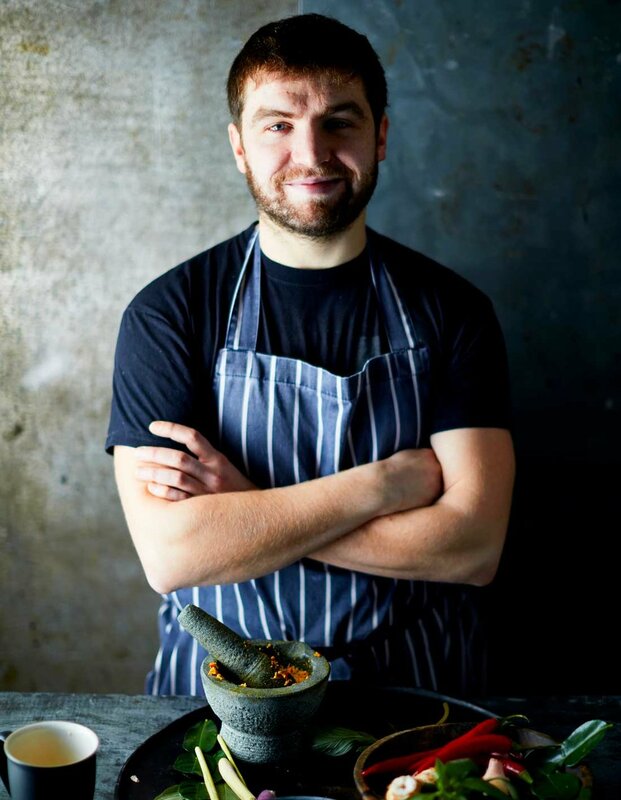 On returning to London Sebby started working at Jane Alty’s acclaimed The Begging Bowl, before moving to 2015’s most lauded new opening, Smoking Goat, Soho, where he spent more than a year as head chef. Easy. Simple. Incredible flavours. What more could you want? Cook Thai brings Sebby’s simple approach to southeast Asian food to cooks of all levels – From Snacks & Nibbles to sharing dishes of Curried Crab Claws, the book builds on everything Seb and team deliver in the restaurant, in a way that’s easy to create at home.